These fundamentals form the bedrock of all future product development, as Flint & Flame strives to establish a brand instantly recognisable for these qualities. We aspire to become the consumer’s first choice for design, quality and value in all aspects of kitchenware and household goods. By keeping to these values we will endeavour to first earn and then maintain the trust of customers and business partners. Flint & Flame not only competed but held its own and in its first year, receiving public support from celebrity chefs ranging from BBC Masterchef’s Monica Galetti to TV personality Jean-Christophe Novelli, and numerous Michelin star chefs such as Martin Blunos and Mat Gillan. In 2012 the company grew even more by building on this support, demonstrating at over 150 shows and events across the country. Flint & Flame grew again and in 2013 appeared at over 200 shows across the UK and Europe, winning corporate clients and retailers along the way. 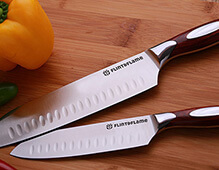 On the back of this success Flint & Flame had a vision of developing a totally new refined product, with a view to creating the perfect knife. This would be achieved by keeping to the core principle of innovative design, high quality and value for money. After many discussions, drawings, prototypes and sleepless nights, the Flint & Flame Knife was created, initially under the brand Rhineland Cutlery. 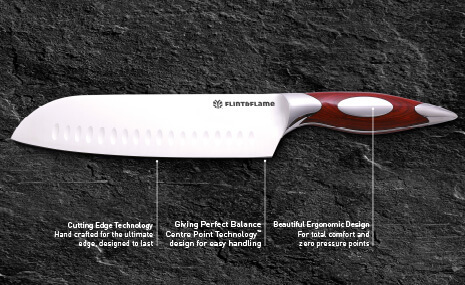 The Flint and Flame (Rhineland Cutlery) Range was introduced simultaneously in the USA and UK in late 2013 and it is fair to say it has taken the industry by storm. Flint and Flame is a rapidly expanding kitchenware brand, supplying tens of thousands of customers with high quality kitchen products helping those who love to cook (and those who don’t) have the ultimate cooking experience. The brand has been developed over the last few years at large Foodies shows, such as the BBC good food show through to smaller county shows, where we meet and talk with our customers daily and get valuable feedback. This feedback has been invaluable to help develop what we believe is not just the best looking knife on the market, but also (based on what our customers say) the most balanced and comfortable product they have ever used. 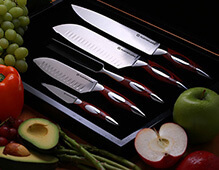 Our knives are world renowned and are crafted and designed with you in mind. Follow us by subscribing to our newsletter The Slice.